The variety of tools, materials, equipment, and supplies (not to mention the knowledge, skills, training, and techniques) required for the preservation of U.Va. Library objects is impressive. Displayed here are a few of the tools found in Preservation Services in Alderman, the Audio and Film Labs in Clemons, and the Dell Conservation Lab. 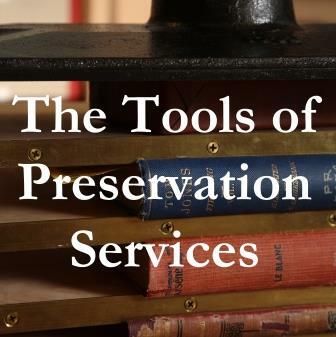 This web presentation is the online version of the exhibit "The Tools, Materials, Equipment, and Supplies of Preservation Services." The physical exhibit is on view as of April 21, 2013, in the Stettinius Gallery of the second floor hallway in the University of Virginia's Alderman Library.